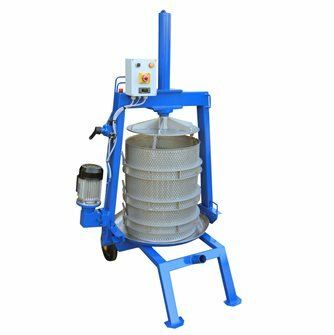 Presses with piston hydraulic movement on a stirrup and 220 volt electric motor, beechwood basket and steel circling, base and feet in steel, comes with wheels. 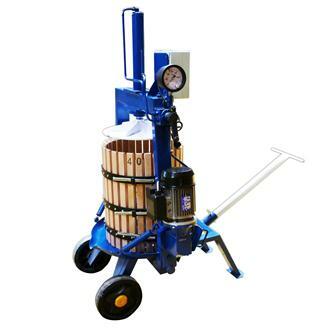 Hydraulic electric press for apples, grapes and other fruit. No central screw. Diameter 60 cm, 212 litre capacity. Apple press, grapes and fruit hydraulic electric without central screw, diam. 50 cm, 128 liters. Apple press, grapes and fruit hydraulic electric without central screw, diam. 40 cm, 69 liters. 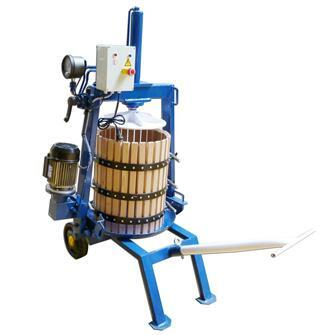 Hydraulic electric press for apples, grapes and other fruit. No central screw. Diameter 50 cm, 128 litre capacity. 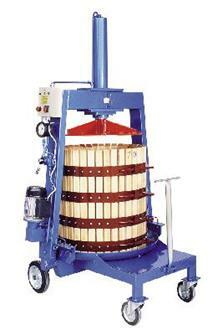 Hydraulic electric press for apples, grapes and other fruit. No central screw. Diameter 70 cm, 327 litre capacity. 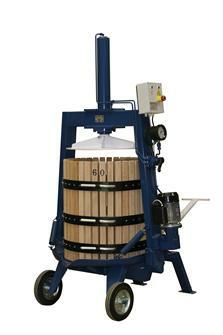 Hydraulic electric press for apples, grapes and other fruit. No central screw. Diameter 40 cm, 69 litre capacity.